Gulab Jamun is a sweet dish made of a dough consisting mainly of milk solids, deep fried to a golden brown and soaked in sugar syrup flavored with cardamom, rosewater and saffron. 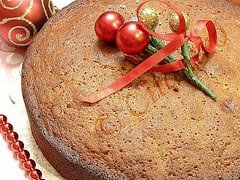 It is similar to the Greek dessert Loukoumas. Gulab Jamuns are an absolute delight when served warm or at room temperature, by itself or topped with ice cream. Mixes and finished products are readily available in supermarkets and it is a convenient option but making it from scratch is worth the try. ¼ cardomom powder or few drops of rose syrup . Mix 1 ½ cups of sugar to 2 cups of water in a vessel/cooking pot. Stir with a spoon on high heat for 10 to 15minutes until sugar is all dissolved in water. Simmer on low heat for another 5minutes. Add ¼ teaspoon cardomom powder or 3-4 cardamom pods, slightly crushed. Add the saffron and keep aside. Transfer this hot syrup into a serving dish ( which can hold all the soaked jamuns ). The syrup has to be warm when the fried jamuns are added. Mix the khowa well. Sieve the flour (maida) and baking powder. Mix the Khowa and flour and knead well. Add the milk and adjust to form a soft dough. Keep aside for half an hour. 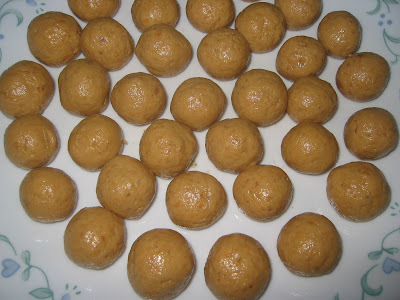 After half an hour knead it again and make balls by gently rolling each portion between your palms into a smooth ball. Place the balls on a plate. Keep aside. Heat the ghee in a deep frying kadai/pan to medium heat and simmer to low heat and slip the jamuns into the ghee, one by one. Remove when the jamuns rise above the ghee or when it turns to golden brown. Fry the remaining jamuns gently and stir constantly to ensure even browning on all sides. Keep turning the jamuns until they are a golden brown all over. Add the fried jamuns directly into the warm syrup. Serve warm or at room temperature topped with ice cream. 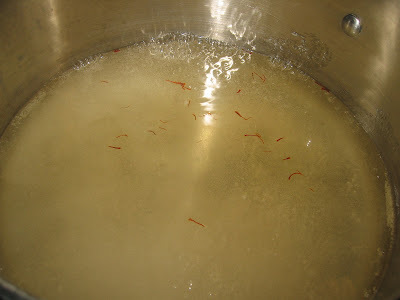 Tips: To make khowa/khoya: Add the milk to a heavy bottomed vessel and simmer on low heat stirring occassionally untill it forms a thick khowa/khoya. I make them well in advance and freeze them for later use. I use whole milk. Add few teaspoons of milk powder if the required consistency is not reached. 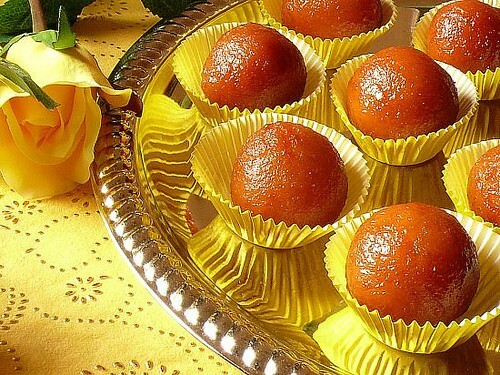 Do not increase the flour content~ the less flour there is in the dough, the better the quality of the gulab jamun. 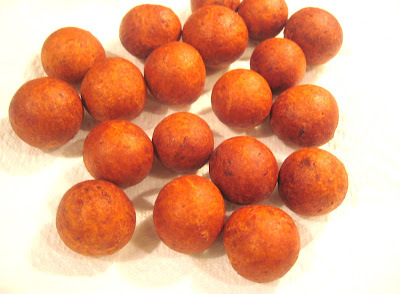 If the balls are browned too quickly or not fried long enough, they tend to collapse in the sugar syrup. The Jamuns must be constantly stired while they fry, do not increase the heat while frying the jamuns. Take gentle care while frying the Jamuns. 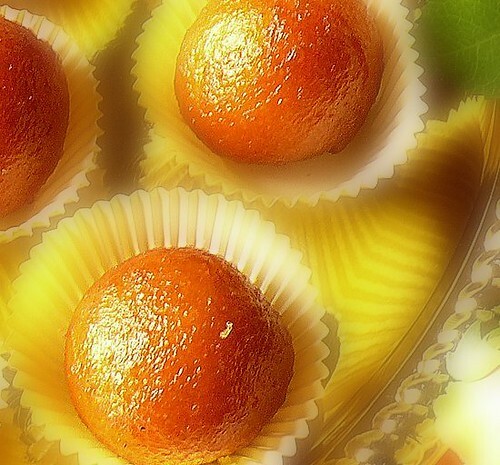 A little extra care makes soft melt-in-the-mouth Gulab Jamuns. Wow! Looks beautiful! Without cracks! Mine cracks every single time... and I was advised to let the jamuns cool a little bit before dropping them in syrup... but yours seems to have worked nicely even without that. How did you manage to get them perfect? Knead the dough well before you roll them into balls and try to fry few at a time . It works for me and hope it works for you. I fry 4 to 5 at a time. Mrs Kannan, I think you have used more flour or the khowa must have been too thick. Cilantro, I tried this jamun and it came out very well. Thanks for the recipe. Khoya is made from milk . Whole milk is heated on low heat to eliminate 85 to 90%of moisture in them. 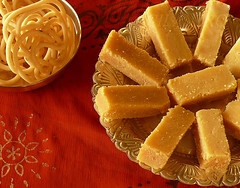 It is used in many India sweet preparations. At the end of the recipe I have mentioned about making Khoya. Hope that helps. can i use paneer instead of flour? You could use Paneer instead of Khoya but not the flour. Flour is the binding agent and hence I would assume it is a must. I have not tried it though and it is my recommendation.